Brad Anderson is one of our most underrated filmmakers, bringing his precise directorial eye to works like “Session 9” and “Transsiberian,” while also taking time to elevate shows such as “Fringe,” “The Wire” and “Boardwalk Empire.” When he’s working with the right material, Anderson is a craftsman, never wasting a shot or allowing a moment to feel under-considered. Even films that arguably fell apart at some point in the production process like “The Call” or “Vanishing on 7th Street” have been elevated by Anderson’s involvement. (And those interested in genre should seek out his episode of “Masters of Horror” titled “Sounds Like,” one of the best in the short-lived Showtime anthology series.) My clear admiration for the director amplifies my frustration with his latest. The dread and atmosphere of something like “Session 9” or “The Machinist” that should have been a natural fit here is absent. It may not be his worst film overall, but “Stonehearst” is Anderson’s flattest film, a disappointingly shallow affair that wastes an opportunity to breathe life into a timeless Edgar Allen Poe short story. The story abruptly shifts to an asylum shrouded in fog. Edward Newgate (Jim Sturgess) is the Jonathan Harker of this story, the man coming to the dangerously-lit castle in the middle of the night. Echoes of “Bram Stoker’s Dracula” and “Shutter Island” hang heavy in the air, again promising a film with something to say and personality to spare; setting a table on to which too slight a meal is placed. As Lamb shows Newgate around the grounds, it becomes clear that something is very, very wrong. Despite all indications that the young man should flee, his new infatuation with Eliza forces him to stay. He’s going to save her; get her free of this torture palace. The male doctor as white knight for the infirm female—again, this seems like material ripe for interesting commentary but writer Joe Gangemi wastes every opportunity to do so. “Stonehearst Aslyum” becomes something of a tease: every time you think it’s going to develop into something interesting, it pulls away from you. For a film about insanity and abuse of power, it’s surprisingly tame. 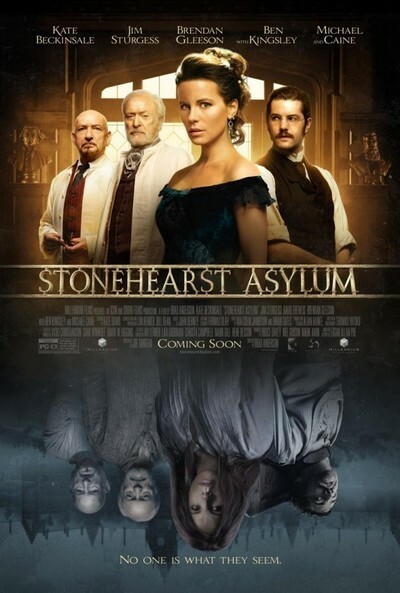 The lack of thematic substance wouldn’t be an issue if “Stonehearst Asylum” had the personality it should have with someone as talented as Anderson at the helm. “Stonehearst” should be a Hammer film, rich with dark corridors and oppressive shadows. While the production design may be authentic, and one can admire Anderson’s desire to stay truthful with his period, it leads to a film that’s surprisingly dull visually. I like that Anderson doesn’t resort to jump scares or other modern horror techniques, but he hasn’t replaced those tricks of the trade with the dread required for this story to work. Of course, it’s not Anderson’s fault that Gangemi’s script is shallow and repetitive—there has to be at least 12 scenes of Newgate trying and failing to convince Graves to leave, for example. There’s something more disappointing about seeing great parts that don’t cohere into an interesting sum than a film that never could have worked at all. Seeing legends like Kingsley, Michael Caine and David Thewlis in a Poe adaptation should have been a genre highlight of the year, and could have really been the film to make Brad Anderson a household name. Time will earn Brad Anderson the praise he deserves. And time will forget this film exists.